Stew is the food of winter days, coming home from school and a big plate of it for dinner, with pools of butter in the mash, I can still taste it. The key to a good stew I think is to cook it slowly so that the meat is really tender. So inspired by a few tweeters talking about their Italian Beef Stew recipes I threw some stuff into my prized Le Creuset casserole, it tasted amazing, and therefore it’s appearing here. My love of chorizo continues. The measurements here are what I did as opposed to what you must do, there are lots of other veg you could add too, this is based solely on what was in our fridge today. I usually serve stew with mash but its very good with couscous too. I also forgot to take a photo when it looked pretty so I quickly snapped the portion I had kept over for the boys’ lunches tomorrow, the next time I make this I will add a beautiful photo. (If I remember). I have a casserole that I can use both on the hob and in the oven, if you don’t then use a large saucepan or frying pan for the hob part and then transfer into a casserole dish with a lid and cook. Heat the oven to 180C. Heat the sunflower oil in the casserole on the hob (or the pan if your casserole can’t go on the hob). Put the beef pieces into a plastic bag and add the flour and salt and pepper, tie the top and shake until the beef is covered in flour. Add the seasoned beef and the chorizo to the oil and fry over a low heat, don’t let the pan get dry, you can add a little water if that happens. Chop the onions and add them in, the beef should be starting to brown, peel and dice the carrots and add them, then slice the peppers and throw them in too and fry it all for a couple of minutes. If you are transferring to a casserole do this now. Add the tins of tomatoes, peel the garlic cloves and add them whole, add the sugar and rosemary, stir well. Add a little cold water so that the meat is all covered, then place the lid on and cook in the oven for about 2 hours, til the meat is tender. 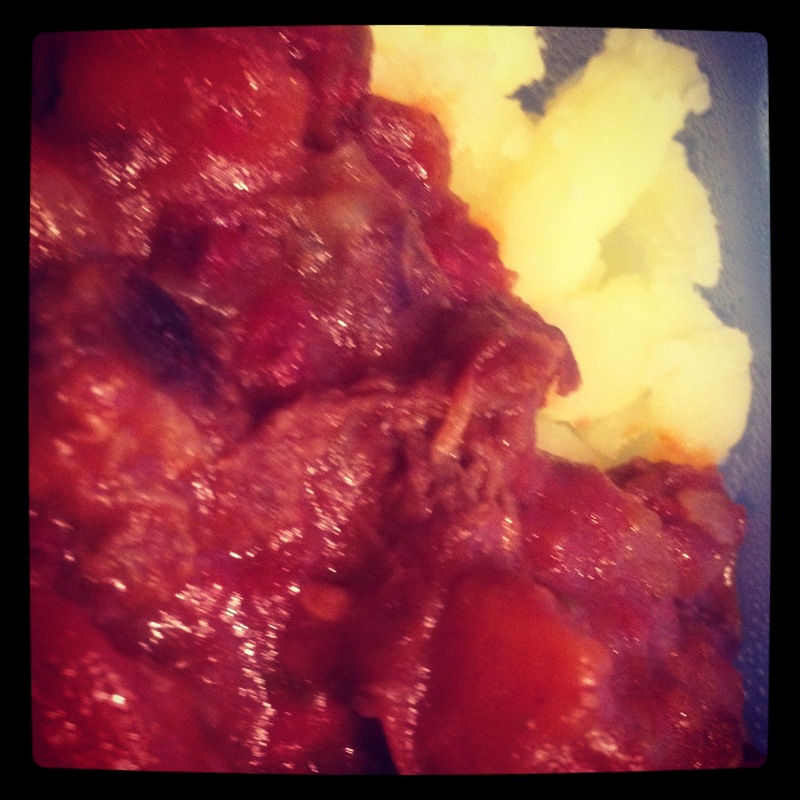 Beef, Casserole, chorizo, easy, recipes, stew, winter dinner. Bookmark.